Abstract: Brachycephalic (short-muzzled) dogs are increasingly popular pets worldwide, with marked increases in registrations of breeds such as the Pug and French Bulldog over the past decade in the UK. 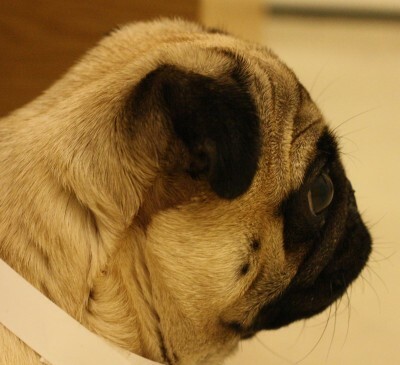 Despite their popularity, many brachycephalic breeds are affected by an early-onset, lifelong respiratory disorder, brachycephalic obstructive airway syndrome (BOAS). This disorder arises due to a mismatch in the proportions of the skull and the soft tissues held within the nose and pharynx, resulting in obstruction of the airway during respiration. Increased airway resistance encourages secondary changes such as eversion of the laryngeal saccules and collapse of the larynx. Clinical signs of BOAS are often early onset and chronic, including dyspnea, exercise intolerance, heat intolerance, and abnormal and increased respiratory noise. Episodes of severe dyspnea can also occur, leading to cyanosis, syncope, and death. BOAS may have a severe impact upon the welfare of affected dogs, compromising their ability to exercise, play, eat, and sleep. Although a well-described condition, with surgical treatments for the palliation of this disorder published since the 1920s, many dogs still experience airway restrictions postsurgically and a compromised quality of life. In addition, the prevalence of this disorder does not appear to have substantially reduced in this time, and may have increased. Ultimately, strategies to improve the breeding of these dogs to prevent BOAS are required to improve brachycephalic health and welfare. Recent studies have revealed conformational risk factors associated with BOAS, such as short muzzles and thick necks, which should be discouraged to avoid perpetuating this serious disorder. Positive changes to brachycephalic health may be impeded by a perception of BOAS being "normal for the breed". This perception must be avoided by owners, breeders, and vets alike to prevent undertreatment of individuals and the perpetuation of this serious disorder to future generations of dogs.